to what it is today." 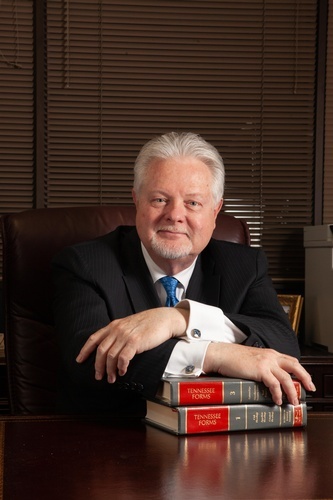 Larry L. Crain is a nationally recognized constitutional lawyer and frequent lecturer, and commentator. He has litigated, debated and practiced widely in the area of constitutional law and human rights. Crain's concern for First Amendment issues, particularly the rights of individuals to be free of religious discrimination, led him early in his legal career to serve as General Counsel for the Rutherford Institute and later as Senior Counsel for the American Center for Law and Justice where he litigated a broad spectrum of constitutional issues on a national level before the United States Supreme Court, the Third, Fifth, Sixth, Seventh and Ninth Circuit Courts of Appeal, the Supreme Court of Massachusetts, the Supreme Court of North Carolina and the Supreme Court of Tennessee. His litigation experience on issues of constitutional law spans 26 states. Crain’s victories in the area of constitutional law and civil rights have been the subject of numerous newspaper, magazine and television profiles, ranging from CNN, Inside Edition, Fox News, the New York Times, Washington Post, Good Morning America, ABC News and NBC News as well as several international newspapers. He has been the subject of three profile articles by the Tennessean for his accomplishments in the area of constitutional litigation. Crain gained international renown for his representation of a Russian child in a celebrated case of child abandonment and neglect in which the adoptive mother in Tennessee returned her son to Russia with a note pinned to his backpack. In Re Justin Hansen, 2014 WL 3058439, at (Tenn. Ct. App. June 7, 2014). Crain has lectured on constitutional law and religious liberty issues at the University of Strasbourg in France and also served as Adjunct Professor for Law and Religious Studies and Moody Graduate School in Chicago. In 2012, his concern over the legal issues facing churches and religious ministries led him to found the Church Law Institute, a non-profit legal and educational ministry serving churches across the United States. Today, CLI is providing vital legal services to churches in states all across the United States. Born in 1955 in Tennessee, Larry L. Crain earned a Bachelor of Science degree from Vanderbilt University in 1976 and a Juris Doctorate degree from the Nashville School of Law in 1980. He is married to Florence Crain and has four children and seven grandchildren.